The Omega2, being an IoT Computer, is a connectivity device. Here we’ll discuss the Omega2’s MAC addresses, how they’re allocated, how to read them, and how to programmatically generate a unique ID based on them. A MAC (Media Access Control) address is a unique, 6-byte identifier assigned to network interface controllers. Devices with multiple network interfaces must have a unique MAC address for each interface. 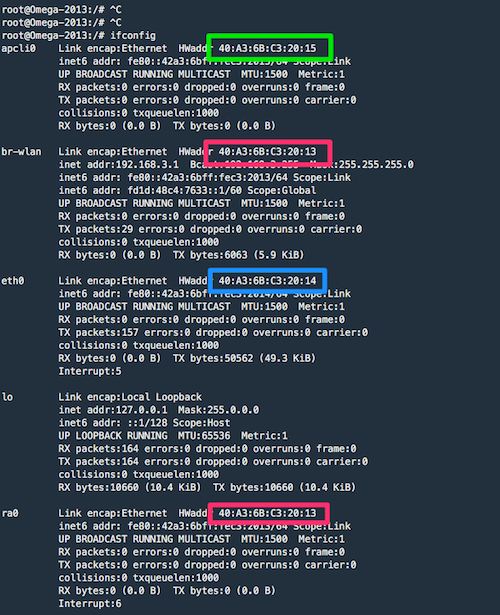 The iwpriv command can be used to access the wireless driver parameters, among these parameters are the MAC addresses. When working with IoT devices, it’s always useful when an ID that’s unique to each device can be generated with the same code. And what better to use than the device’s own MAC address. echo "Unique ID based on MACD for this device is: $uid"
Feel free to translate this code to other languages and use it in your own applications.